So one of my favourite foods is dwaejibulgogi, korean spicy pork belly bqq! 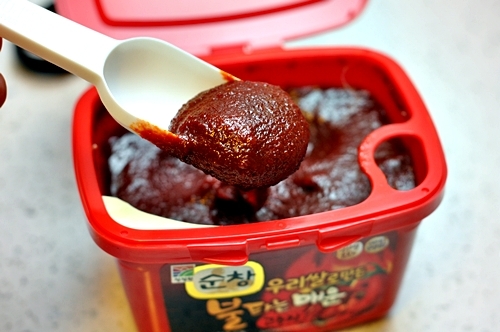 It’s deliciously chewy, sweet and spicy. When eaten with lettuce wraps, you get a crisp, clean bite that compliments the many flavours of the meat and spicy dipping sauce. This recipe is super easy to make. Although the original recipe calls for Korean pears, I use regular ripened Bosc pears, which you can get at any super market. You can find the original recipe here on Maangchi’s website. Take all marinade ingredients and blend together. Once fully incorporated, mix with pork belly and marinate in a plastic container for a minimum of one hour to maximum of overnight. Shake off excess marinade and grill until nicely reddish brown. Serve with ssamjang, steamed rice, and freshly cleaned lettuce. Take one piece of lettuce and place a little steamed rice inside. Grab one piece of pork belly and top with a bit of ssamjang. Fold and eat in one bite. I hope you will enjoy this recipe as much as I and my family do. Happy Eats!